Macy's Birthday Sale = BIG Savings for YOU! Are you ready to save on what you need for this season and beyond? Then get ready to shop Macy’s Winter Weekend Sale going on right now! 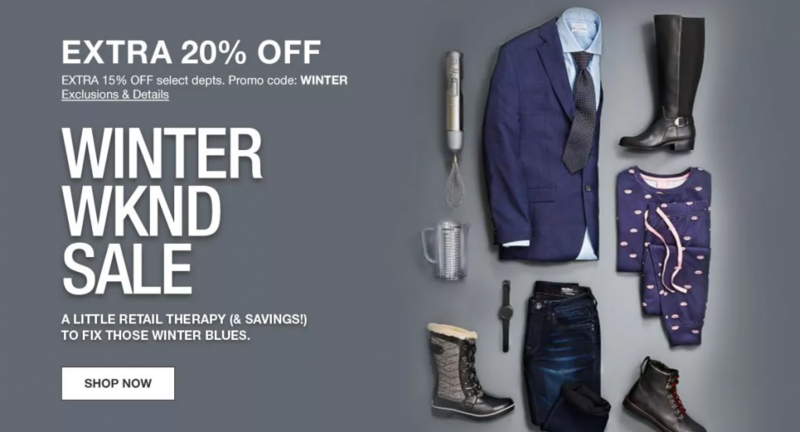 I’ll be honest, I’ve never seen the Winter Weekend Sale happen at Macy’s before, but with a discount code for an extra 20% off in most departments, I’ll take it. Keep in mind, the code (which I’m sharing with you below) is good for additional savings on top of the already low sale prices being offered in almost every department. Many of us are digging out of a deep freeze and lots of snow from the past week, so it may surprise you to learn that coats are on sale for an extra 50-60% off. You’ll also find great deals on sheets and pillows going on this weekend too. While we know this Macy’s sale will go through Sunday, we never know when the next Macy’s sale will be and I’d hate for you to miss out on the extra savings. TO GET THE EXTRA APP SAVINGS: Your single-use promo code will automatically be applied in your app shopping bag toward your next app order. New app customers only. Must sign in or create an account in the app to qualify. Only one promo code may be used per transaction. If the promo code is removed from the bag, you will not receive extra savings on your order. 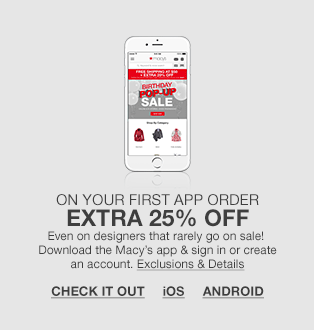 Don’t forget, you can save even more if you shop online at Macys.com and elect to pick up your items in store. Just one more way to save!